Much has been said in regards to Barack Obama’s revolutionary use of technology during both his 2008 and 2012 campaigns for President of the United States. Yet, during his administration, that groundbreaking tactic suddenly disappeared. In 2013, with the launch of the We The People website, the Obama administration focused its efforts on reigniting that feeling of connection that powered two successful elections. The site was created as an update to the Office of Public Engagement, which had drawn criticism in past administrations for its ineffectiveness. While the website and corresponding social media presences are an intriguing start, they have thus far failed to promote meaningful interaction between the people and the presidency. Thus far, the privacy and security of the White House is incompatible with the type of public interaction that social media so uniquely provides. Efforts to engage the public are meant to sidestep the special interest groups that have dominated governmental discourse over the past several decades. The dominant theme according to the “We The People” rollout is to open a dialogue directly between the people and the administration, one that will meaningfully impact policy and legislation. Yet, the website has not led to any significant legislation at present. Screenshots of We the People at whitehouse.gov and data.gov, two of the Obama adminstrations projects to increase public access to government. Conversely, the growing capacity of Internet communications has augmented the power of special interest groups. The general public can align with interest groups via the web, thus making such groups much larger and more powerful than ever before. The disproportionate impact of the internet on the presidency and special interest groups only furthers the gap of influence between the public and the president, the very opposite of the Obama administration’s intent. The Obama Biden administration has also worked to use digital technology to aid in its very first legislative actions. The transition from election to inauguration day was planned out on public websites, namely Change.gov and Transition.gov, allowed Obama to access the national agenda and the citizenry in a way no other President-Elect has before. As he met with Congress and other major financial interests in advance of the drafting of the stimulus package, Obama publicly showed his commitment to advancing the mandate set for him by voters and that he would keep them updated every step of the way. On his first days in office President Obama began enforcing the Open Government Initiative, publicizing data from federal agencies and creating social media presences that capitalized on the efforts of his campaign. Yet these strategies, were not perceived as thoroughly altruistic. Voters almost immediately showed the signs of cynicism so strongly associated with the executive office. But the long-term results of these transparency efforts is yet to be seen, indeed two of the three highlighted sites: transition.gov, change.gov were temporary, and the We The People site did not launch online until 2011 so there is a lack of conclusive data on just how effective they have been quantitatively. One can however, consider news coverage of the Obama administrations forays into online governance as well as comparative studies of how Internet technology has developed under the last three presidents. Furthermore, one can speculate that the use of the Internet over the last six years represents the very earliest stages of an entirely new system of government; the likes of which we will see expand exponentially in the coming decades. 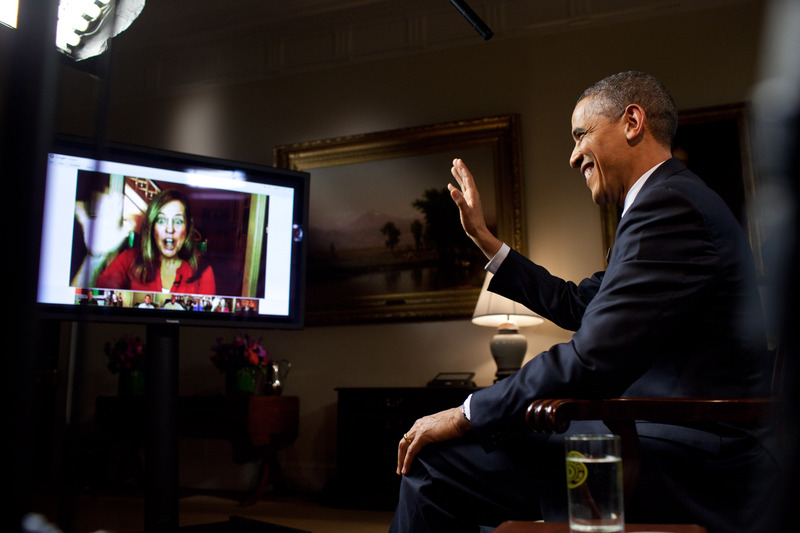 President Obama uses Google+ to take questions about a State of the Union address (2012). Photo: Pete Souza/White House. Yet the most important facet of such changes is judging how the American people will interact with them. The generally accepted notion is that using online communication increases accessibility and promotes cooperation and information sharing amongst its users. Certainly that has been the media strategy around President Obama’s use of the Internet to communicate his goals and increase public interaction with government agencies. Yet, sizable distrust of such applications is powerful in the country today, how then can these technologies develop into a more inclusive system of government when interest groups are disproportionately benefitting? Legal and security restrictions limit the executive branch’s ability to use social media in the rapidly changing and insecure ways that other interest groups can. In that way, technological advances intended to stimulate real democracy are instead increasing the distance between the public and the government. Interest groups can interact with voters much more effectively over the Internet today because they have a greater capacity to study and develop digital strategies. They are thus accruing power while the President seeks to apply the lessons learned during his Presidential campaign. Creating an environment where the citizenry is directly represented by its government has been a goal of western-style democracy since its inception. Today and looking forward that same struggle is playing out in a new environment. The use of Internet technology will without doubt affect the way countries are governed in the 21st century and President Obama’s administration has made significant and substantial efforts to increase democracy through cyberspace. As stated in a November 2014 address to the public regarding net-neutrality, “The Internet has been one of the greatest gifts our economy — and our society — has ever known.”1 What follows is an analysis of those attempts, comparisons to past President’s engagement efforts and a look at what is to come in this rapidly changing industry. The Office of Public Engagement was the newly renamed version of an existing entity in 2009 when it was first used to accompany the rollout of the Affordable Care Act. Prior to that overhaul, the Office of Public Liaison (OPL) had been a part of the Executive Branch since the Ford administration. President Nixon however, was the first to designate White House staff specialists to specialize in managing relationships with public interests and begin to consolidate them.2 Each previous administration following the passage of the New Deal had liaison specialists within varying departments but as interest groups became increasingly sophisticated so too did the administrators handling them. President Ford revolutionized the media strategy of public liaisons, by branding the Office of Public Liaison to suit his public narrative. The Office of Public Liaison was marketed to the people as a new chapter of open relations between the people and their executive, assuring that voices would be heard in the new administration. Baroody and Ford launched a pseudo-press tour for the new department, with twenty-four national conferences across the country each focused on a different public concern. Administrators and professionals alike attended these conferences and several included speeches by Ford himself.4 Here the Ford administration recognized a public perception problem existed and was creating significant issues for his presidency. By creating a powerful and accessible media strategy to accompany the rollout of a new department, Ford did what Obama has not done and set the tone for change and taken full responsibility and credit for it. These events opened the door for perhaps the most long-lasting change inherent in the creation of the OPL, the inclusion of social interest groups. Liaison relationships had long existed between the White House and business and labor interests. Indeed such groups have actively sought representation and provided input into legislation since the Industrial Revolution. Conversely, under Ford’s Office of Public Liaison, groups representing women and minorities began gaining in influence.5 The original intent of the OPL may have been scripted as a way for the public to communicate directly with government but in actuality its effective purpose was to streamline the process by which special interests influence governance. Here one can see the major environmental differences between the Clinton and Obama administrations. Internet technology was still rudimentary and was not producing the potent real-time news coverage that is customary today. More importantly however, the Internet has provided a new forum for interaction and communication that creates almost unlimited access both to information and to misinformation. The Office of Public Liaison (now the Office of Public Engagement) has consistently worked to maintain a public-facing image of openness to the public. CNN. “Election Tracker 2008: Fundraising” Last modified October 15, 2008. http://www.cnn.com/ELECTION/2008/map/fundraising/ Accessed December 1, 2014. FactCheck. “Average Campaign Contributions” Last modified July 15, 2008. http://www.factcheck.org/2008/07/average-campaign-contributions/ Accessed December 1, 2014. Fox, Zoe. “The Digital Smackdown: Obama 2008 vs. Obama 2012.” Mashable. September 23, 2012. http://mashable.com/2012/09/23/obama-digitial-comparison/ Accessed December 1, 2014. Gallup. “Presidential Approval Ratings -- Barack Obama.” Last updated November 23, 2014. http://www.gallup.com/poll/116479/barack-obama-presidential-job-approval.aspx accessed December 1, 2014. Harris, Heather E., Kimberly R. Moffitt, and Catherine R. Squires. The Obama Effect, Multidisciplinary Renderings of the 2008 Campaign. New York: State University of New York Press, 2010. Hunt, Karen M., and Charles E. Walcott. Empowering the White House: Governance Under Nixon, Ford, and Carter (Studies in Government and Public Policy) Kansas: University Press in Kansas, 2004. Jacobs, Lawrence R. “The Privilege of Access: Interest Groups and the White House.” in The Obama Presidency, Appraisals and Prospects, ed Bert A. Rockman et al. (Washington: CQ Press, 2012), 149-170. Pika, Joseph A. “The White House Office of Public Liaison” Presidential Studies Quarterly 39(3) 2009: 549-573. Accessed December 1, 2014. doi: 10.1111/j.1741-5705.2009.03690.x. Stone, Peter H., “Friends After All.” National Journal 26(43) 1994. Accessed December 1, 2014. doi: 02133013/200320271. The White House. "The President’s Statement on Net Neutrality." Last modified November 10, 2014. < http://www.whitehouse.gov/net-neutrality >. 1.) The White House, "The President’s Statement on Net Neutrality," The White House Office of Public Engagement, Last modified November 10, 2014, < http://www.whitehouse.gov/net-neutrality >. 2.) Joseph A. Pika, “The White House Office of Public Liaison,” Presidential Studies Quarterly 39(3) 2009: 555, Accessed December 1, 2014, doi: 10.1111/j.1741-5705.2009.03690.x. 3.) Karen M. Hunt and Charles E. Walcott, Empowering the White House: Governance Under Nixon, Ford, and Carter (Studies in Government and Public Policy) (Kansas: University Press in Kansas, 2004), 90-91. 5.) Lawrence R. Jacobs, “The Privilege of Access: Interest Groups and the White House,” in The Obama Presidency, Appraisals and Prospects, ed Bert A. Rockman et al. (Washington: CQ Press, 2012), 155. 6.) Jacobs, “The Privilege of Access” 160. 7.) Peter H. Stone, “Friends After All,” National Journal 26(43) 1994, Accessed December 1, 2014, doi: 02133013/200320271. 9.) Heather E. Harris, Kimberly R. Moffitt, and Catherine R. Squires, The Obama Effect, Multidisciplinary Renderings of the 2008 Campaign, (New York: State University of New York Press, 2010,) 57. 11.) CNN. “Election Tracker 2008: Fundraising” Last modified October 15, 2008. http://www.cnn.com/ELECTION/2008/map/fundraising/ Accessed December 1, 2014. 12.) FactCheck, “Average Campaign Contributions,” Last modified July 15, 2008, http://www.factcheck.org/2008/07/average-campaign-contributions/ Accessed December 1, 2014. 14.) Zoe Fox, “The Digital Smackdown: Obama 2008 vs. Obama 2012” Mashable, September 23, 2012, http://mashable.com/2012/09/23/obama-digitial-comparison/ Accessed December 1, 2014. 15.) Adam Sharp, “100 Senators and the 57th Inauguration” Twitter Blog, January 18, 2013, https://blog.twitter.com/2013/100-senators-and-57th-inauguration Accessed December 1, 2014. 19.) Cogburn and Espinoza-Vasquez, “From Networked Nominee, to Networked Nation” 207. 20.) Gallup, “Presidential Approval Ratings -- Barack Obama” Last updated November 23, 2014. http://www.gallup.com/poll/116479/barack-obama-presidential-job-approval.aspx accessed December 1, 2014. 22.) Snead, “Social media use in the U.S. Executive branch” 58. Leah C. Campbell graduated in 2015 with a Bachelors degree in Political Science from Northeastern University in Boston, MA.